We call this gentleman, whose photo was captured and passed along to us by our Greenpoint Correspondent, The Thinker of Huron Street. 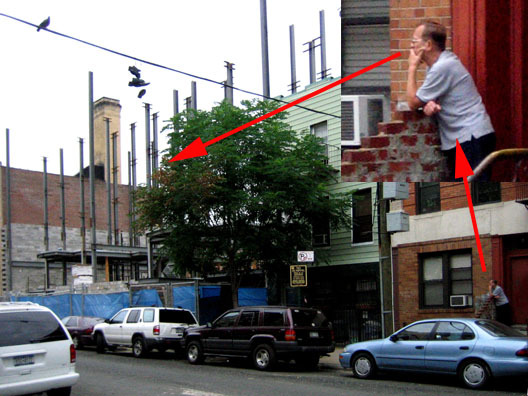 Here, we find him practicing the Greenpoint Stare while gazing upon his rising neighbor at 143 Huron Street. We are given to understand that he actually has many things to think about including the rear end of Magic Johnson's 110 Green Street condo project and Huron Street itself. Of the later, our correspondent notes, "The street has recently been exfoliated and reeks of delicious asphalt. When a nice breeze kicks up the grit blows in your eyes. It is very unpleasant." Leave that dude alone! Jesus. You're stalking him.